The Eastside Rail Corridor (ERC) is envisioned as a future multi-use corridor within the 42-mile right-of-way of the disused Burlington Northern rail line. 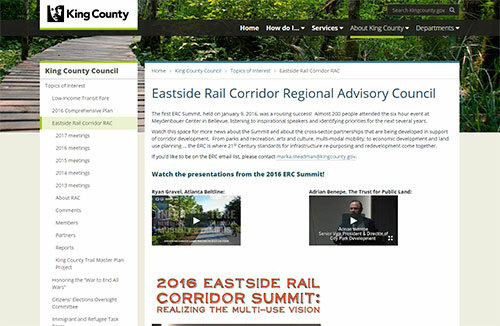 The ERC will connect rapidly growing East King County communities via an end-to-end trail, as well as transit and utilities. Segments of the ERC trail in Redmond and Kirkland are already open, and it will be possible to explore a total of 13 miles of trail in 2018. By 2020, even more miles will be open! Explore the map below to learn about progress towards building an end-to-end trail in the corridor. Get the latest details by clicking the links to visit webpages hosted by the public agencies planning and building out the corridor. 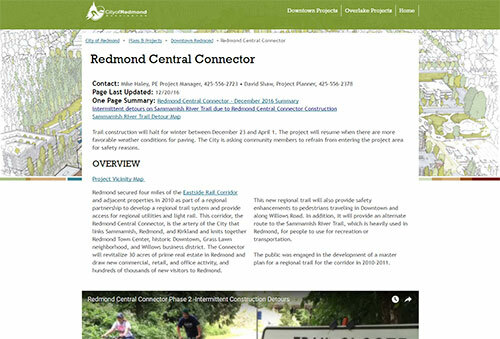 King County is planning for a trail connection from its East Lake Sammamish Trail (ELST, 13 miles, from Redmond to Issaquah) to the Redmond Central Connector (RCC). East Link light rail service begins 2024 from the future downtown Redmond station, to be located in the corridor adjacent to the Redmond Central Connector. An RCC to ELST connection would get people to transit and to other eastside communities, increasing the reach of the Eastside Rail Corridor. Design for the Wilburton segment will be underway by King County as of fall 2017. Beginning at south Kirkland city limits, this ERC segment heads south through Bellevue, terminating north of the existing I-90 rail overpass in Bellevue’s Factoria area. Once complete, the ERC trail in the Wilburton segment will create new bike and pedestrian trail connections in King County’s eastside and the region at-large. The ERC will help connect both Bellevue and Kirkland to Seattle via Northup Way and SR-520 trail, and to Redmond, via the SR-520 trail. The ERC segment through Bellevue will include an overpass at NE 8th St, to connect people on the ERC to East Link light rail service at the trail-adjacent Wilburton Station. 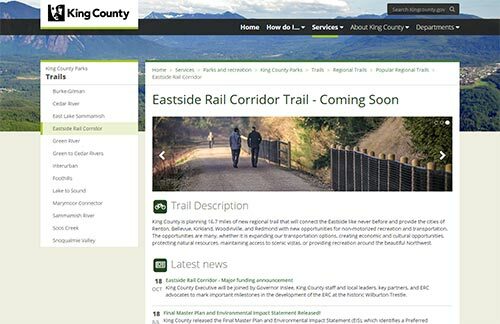 An interim connection to the I-90 corridors Mountains to Sound Greenway Trail will also be a part of this ERC section. The 2.6-mile segment of the ERC in Woodinville is owned by the City of Woodinville. They plan to develop the ERC over the next several years. A one-mile section of the ERC, from the Cross Kirkland Corridor at 108th Ave NE to Northup Way, will open by spring 2018 as an interim gravel trail. This area is part of the 5-mile Wilburton segment of the ERC owned by King County. With multiple owners, the the ERC is being planned and developed in numerous segments, with close coordination among public owners and stakeholders in order to create a cohesive end-to-end trail user experience. Explore the map below to learn more about the trail. Trail owners and stakeholders have adopted a multi-use vision for the corridor. In addition to an end-to-end trail, transit is planned in some portions of the corridor. The ERC is also a significant utility corridor. 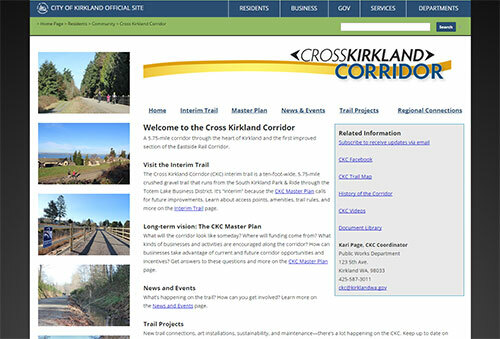 Kirkland’s long-term vision of the Cross Kirkland Corridor is trail plus bus rapid transit. In the segment owned by Sound Transit, a trail will run parallel to East Link light rail for one mile. The Snohomish section of the corridor will incorporate both heavy rail and a trail, and that is also a potential alignment in the northern King County segment through Woodinville.